Edible flowers bursting with flavor & colors! 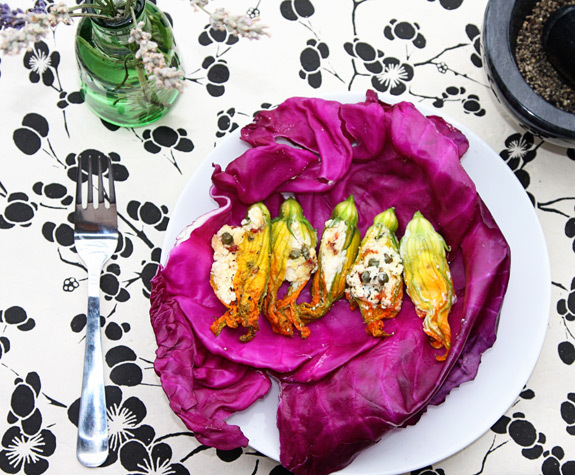 Bursting with vibrant colors these beautiful edible flowers have serious culinary powers! 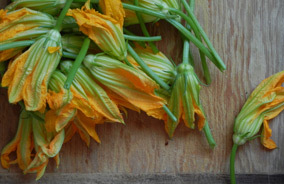 Squash blossoms are the sweet and tender flowers of growing summer squash. 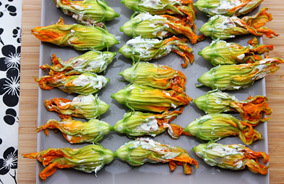 These gorgeous blossoms can be stuffed and fried, or added to quesadillas, soups and risottos. Their flavor is delicate with a hint of the zucchini they would have become if left on the vine. You can find them at the farmers’ markets from late spring to early fall. 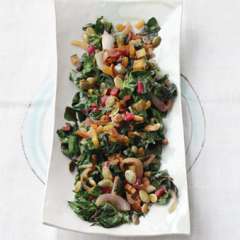 They bring a beautiful orange and yellow burst of color to any dish. Enjoy! 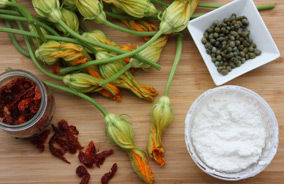 STEP 1: Remove the pistil from all squash blossoms (the inner yellow stem located inside the flower) and the long green stem located at the base of the flower. STEP 2: Run the blossoms under cold water to remove any dirt or bugs, and set aside on a paper towel. STEP 3: In a bowl, mix together ricotta cheese, sun-dried tomatoes and capers. STEP 4: Scoop a spoonful of the cheese mixture into the center of each flower and secure with the flower petals as much as possible. 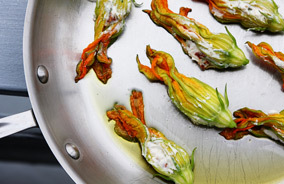 STEP 5: Transfer prepped blossoms into warm skillet with extra virgin olive oil & lightly cook for a few minutes on each side. Cook until thoroughly heated or until lightly browned.